← ¡Vámonos! / Let’s Go! 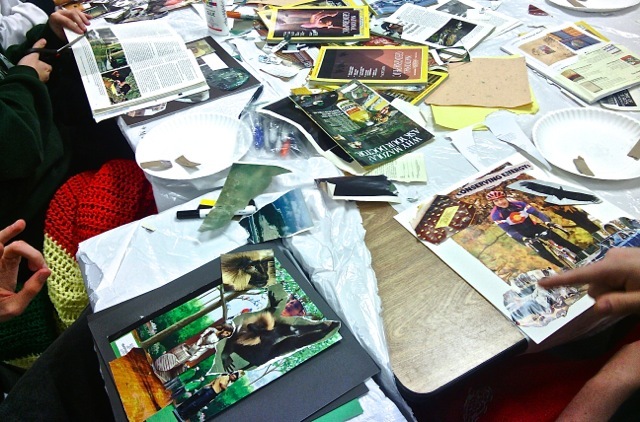 Collage workshop with students at Lansing Community College, November 2014. Monday greetings! I’m back to Kalamazoo after four days road-tripping a swath of Michigan: the Bay area, Greater Lansing, and near the borderlands of “Michiana“. I’m feeling especially grateful for the variety of persons — past and present — who are part of what I do in the creative-healing arts. A special shout-out to collage-workshop participants from last week! Teacher and students, you were wonderful. Plus, it was a bonus visiting my alma mater and former employer Lansing Community College. 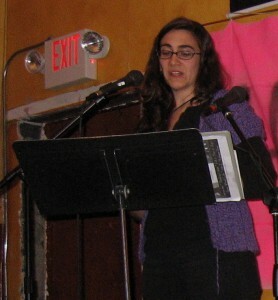 Performing at HerStories of Pleasure & Pain, Mar. 2007, at Magdalena’s Tea House, Lansing, MI, with Survivin’ & Thrivin’. For newer readers of Dey of the Phoenix — which launched in April 2008, inspired on winter retreat in the Hiawatha forest– my work is informed by grad studies in community literacy (2000-05), and entering community arts through poetry/ spoken-word in Greater Lansing (since 2006). For some of my “back story”, check out this Capital Gains interview from 2011. Hard to believe, but it’s been two years now simultaneously branching in Southwest Michigan and tending a heart-root in Lansing. 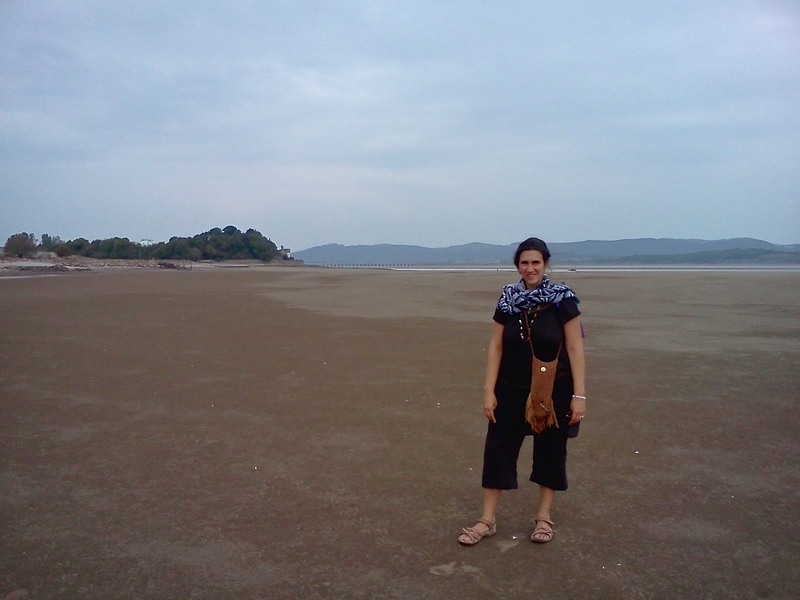 But even stranger to realize that in a few weeks I leave these treasured locales for an artist residency in Peru! With this journey nearing, I’ve been plucking a thread in my development as a writer, artist, and community organizer. 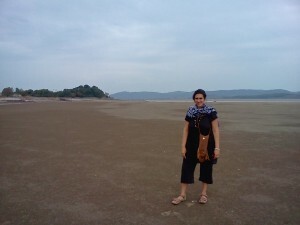 “Time traveling” to the end of my grad studies, I spent my first year in Belgium. In becoming a speaker at a peace demonstration organized by the Brussells Tribunal (Feb. 2005), I was the sole presenter in English among a host of figures. This advocacy of non-violence while abroad was consistent with my public action Stateside (since 2002) and in my field among other academics via Rhetoricians for Peace (2003-05). September 2014. Estuary at Morecambe Bay, emptying into the Irish Sea. During a break from a Quaker course on Experiment with Light using printmaking, organized by Woodbrooke and held at Swarthmoor Hall in Ulverston, UK. Linking to the present, I’m excited that working from a community base does not limit creative-healing work to a singular geography. “Cycling” between heart-root of Lansing, home-base of Kalamazoo, and spiritual communities across continents is productive. Such “flows” engage community across and between “borders” — divisions invented by politics as well as sub/cultures. And as an intuitive artist, for me these cycles catalyze what comes next while deepening an understanding of what’s come to pass. 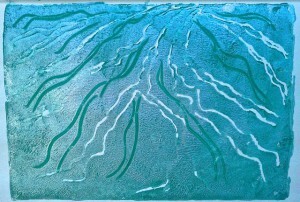 Block print with acrylic paint. I printed three times with varied paints, then added manual lines to lift one or more layers. Created at the course “Experiment with Light: Deepening the Practice”, Sept. 2014, at Swarthmoor Hall and organized by Woodbrooke. In a way, the estuary strikes me as a water bridge between the “in-land” and “at-sea” flow, as well as the element of water in relationship to the moon. I don’t recall these as explicit connections voiced in the work of Gloria Anzaldúa — inspiration for my small press femestiza — yet the likeness is worth exploring. Her essay “now let us shift” (This Bridge We Call Home 2002) is busting with insight about the work of “in-between”, a healing path guided by wisdom of the body and one’s lived experience. As I just am beginning to hear the estuary as a spirit of nature, I aspire to listen to the voice while in Peru alongside the powerful Amazon! No, I won’t be able to visit the Amazon estuary — the largest in the world — but I will be especially close to the Cumbaza River near the village of San Roque. 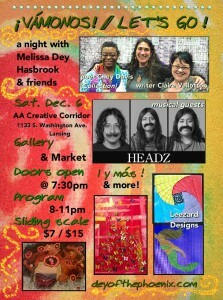 *Fri. 12/5, Kalamazoo @Fire Historical and Cultural Arts Collaborative. My Art Hop (free) feature “Standing in the Light, Part II” opens @5pm, including a collective-art activity @7pm. Then join First Friday Poetry ($5) open mic @8:30pm and my feature @9pm. There will be an open mic during the 8 o’clock hour! *Sat. 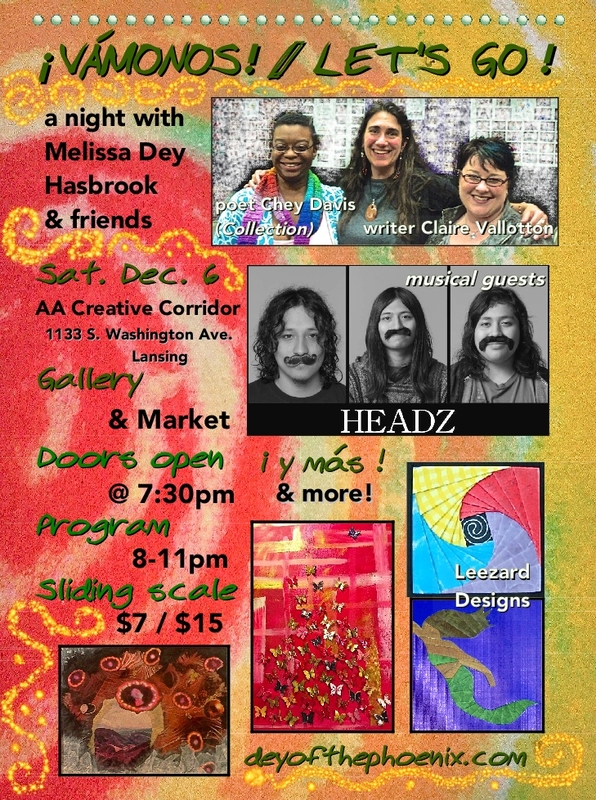 12/6 Lansing @AA Creative Corridor, ¡Vámonos! / Let’s Go!. 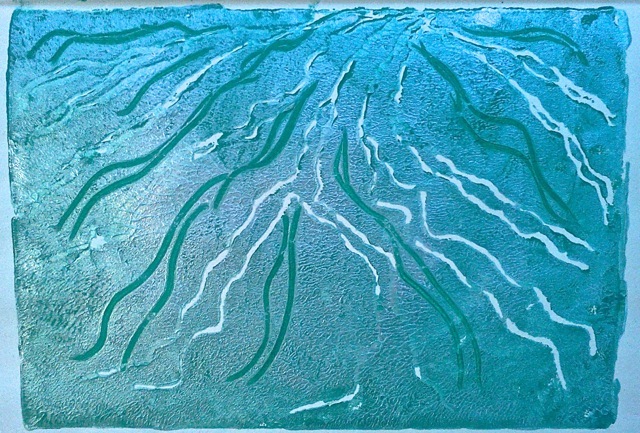 Doors open @7:30pm for the Gallery and Market; works are for sale and/or exhibition. Programming begins @8:00pm reuniting me with friends and past co-performers: poet Chey Davis (Collection), writer Claire Vallotton, musical guests the headz — a three-brother band! — and more. The sliding scale of $7/ $15 contributes toward my upcoming artist residency. A special thanks to Quaker artists Elizabeth Warren (Leezard Design) and Sandra Cade for practical and moral support with the Lansing program on Saturday, December 6! And FYI: besides a send-off for my sustainable-arts-in-the-jungle adventure, it’s also an early birthday-bash; I’ll be turning 4-0 while away on travels. I’m also excited to celebrate seven years of sobriety — walking in the Light, through the Shadows, among loved ones and fellow travelers — at this alcohol-free event. This entry was posted in Uncategorized and tagged AA Creative Corridor, Amazon, Chey Davis, Claire Vallotton, community arts, Elizabeth Warren, estuary, Fire, Gloria Anzaldúa, Headz, Kalamazoo, Lansing, now let us shift, Peru, Sachaqa Centro de Artre, Sandra Cade. Bookmark the permalink.